The NES has so many good games, any list is bound to be incomplete, but here's a few I haven't mentioned yet. Contra: It's got guns and aliens. What else do you want? Also infamous for the Konami code, which allows you to start the game with 30 lives instead of the usual 3 (and even then, I don't think we ever won this game, though we did get pretty far). Double Dragon II: The Revenge: This game is not nearly as good as I remember it, but this brawler was a lot of fun at the time. I believe this second game was the one I owned, and I'm pretty sure I even beat it. Later games would improve considerably on the formula set by these games though, so there's that. Gauntlet: A port of the arcade game, it was still a lot of fun, and very hard in the later levels. What can I say, I was a sucker for the swords and sorcerer stuff. 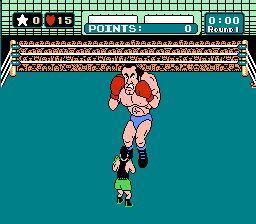 Mike Tyson's Punch Out: That's right, I said it. Mike Tyson. Not Mr. Dream. Who the hell is that anyway? Even to this day, this game is amazingly fun to play (I haven't played the recent Wii version, but I gather that it's pretty much the same game with a few extra fighters and updated graphics, which is all it really needs). One thing that was obvious even to my younger self but which is so blazingly strange about the game is the absurd racial stereotyping that each fighter represents. It's still a great game. Also, when you win a title match and you start training, the music is incredible, some of the best for the NES. 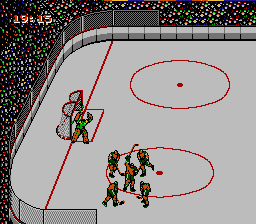 Later boxing games improved graphics and realism, but I think this might remain the best. R.C. Pro-Am: Did you know those were supposed to be radio controlled cars? That's what the R.C. stands for. 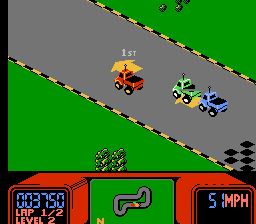 I always thought this was just a regular racing game. And a really, really fun one. For all its simplicity, it's a really great game. That I was never able to beat. Dammit. Shadowgate: This is almost a throwback to those old text adventure games, but it's more formalized for use with a gamepad. I remember being completely consumed by this game when I got it, but it's the sort of game that doesn't do so well upon replaying. Once you know the secrets, it gets a bit boring. Still, it's one of the more memorable games I played.